The Twin Cities of Minneapolis and Saint Paul are built around the Mississippi, Minnesota, and St. Croix rivers and have a population over 2 million including the surrounding areas. Despite the "Twin" moniker, the two cities are independent municipalities with defined borders and are quite distinct from each other. Minneapolis, with its broad boulevards, easily navigable grid layout, and modern downtown architecture, has been referred to as the "first" (i.e. furthest east) city of the American West; Saint Paul, which sports narrower streets laid out much more irregularly, clannish neighborhoods, and a vast collection of well preserved late-Victorian architecture, is considered to be the "last" (i.e. farthest west) of the Eastern cities. Today, the two cities directly border each other and their downtown districts are about 9 miles apart. Medicine has a major presence throughout the Twin Cities and in the southeasterly city of Rochester where the Mayo Clinic resides. Major medical companies also reside in the Twin Cities such as Medtronic, and St. Jude Medical. 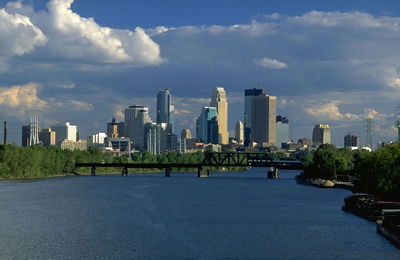 The Twin Cities area is considered the capital for the arts in the Upper Midwest. There is a very high per-capita attendance of theatrical, musical, and comedy events across the area, which some believe may be boosted by the cold winters but can be more realistically attributed to the large number of colleges, universities, and a generally strong economy, providing strong supply and demand for arts. There are more theatre seats per capita than in any other American city, besides New York City. 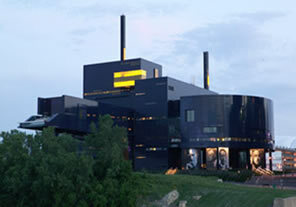 The Guthrie Theater is one of many cultural landmarks. For spectator sports, there is an abundance of professional or top-level amateur sports to enjoy in the Twin Cities. The annual Twin Cities Marathon is held in the fall with a course running through Minneapolis and St. Paul. Several residents and faculty run the marathon each year. It is known as the "most beautiful urban marathon in America". The Minnesota Twins Major League Baseball team plays in the new Target Field, and the Minnesota Vikings, the NFL Football team, has a new stadium arriving. There are a number of lakes in the region, and cities in the area have a very extensive park system for recreation. The Minneapolis chain of lakes are a couple miles from Abbott Northwestern hospital, and are accessible via the Midtown Greenway that runs next to the hospital complex. The Twin Cities are home to the Scenic Grand Rounds that manifests itself as America’s most important urban scenic byway. It is a system of scenic byways connected by over 50 miles of paths for running, biking, hiking, and cross-country skiing. 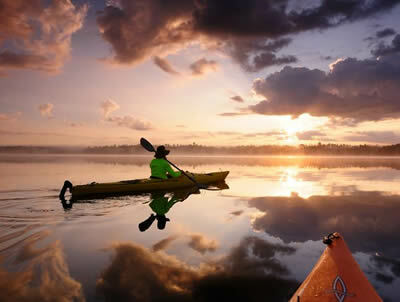 Northern Minnesota holds the Boundary Waters Canoe Area Wilderness and great cities such as Duluth that are full of outdoor activities year-round. 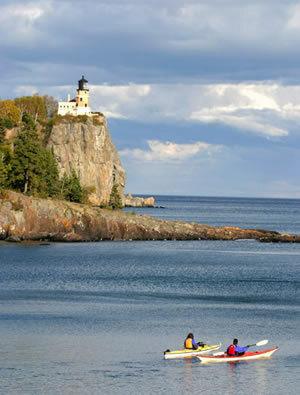 Hiking, camping, and backpacking is abundant in northern Minnesota, but also close to the metro area. There are several local sports organizations such as City Sports Connection, that provides organized recreational teams and events. Outdoor activities do not hibernate during the winter months in Minnesota. Winters are full of activities such as the Saint Paul Winter Carnival, snowshoeing, ice hockey, boot hockey, cross-country and downhill skiing, ice skating on many local lakes, ice fishing, and many others. Owing to its northerly latitude and inland location, the Twin Cities experiences the coldest climate of any major metropolitan area in the United States. However due to its southern location in the state and aided further by the urban heat island, the Twin Cities is one of the warmest locations in Minnesota. What many people love about the state are its distinct 4 seasons. Our summers are hot and find the beaches full, fall is a great season in Minnesota, winter brings a full plate of new activities and beauty, and spring breaks a cold winter and brings a magnificent green blanket to the state. U.S. News named Minneapolis and St. Paul the 5th "Best City for Public Transportation" in the United States! Metro Transit, by far the biggest bus service provider in the area, owes its existence to the old streetcar lines that ran in the area. Metro Transit provides about 95% of the public transit rides in the region, although some suburbs have other bus services. Their website will guide you to any information you might need about the system. The light rail system began regular operations in June 2004, and is run by Metro Transit. Current lines include the “Central Corridor” line connecting downtown Minneapolis and downtown St. Paul, the “Northstar Commuter” line that connects the northwest suburbs to downtown Minneapolis, and the “Hiawatha” line that connects downtown Minneapolis to the airport, Mall of America, and several other locations south of Minneapolis. The light rail system has been expanding and adding new lines and makes movement through the Twin Cities quite efficient. The main airport in the region is Minneapolis-St. Paul International Airport (MSP). MSP houses all the major carriers, however is a hub city for Delta Airlines and Sun Country airlines, and therefore these airlines frequently have the cheapest airfare to/from the Twin Cities.